You couldn’t miss the brightly coloured stripy ship docked in Liverpool back in 2015, but that was the point. Painted all over in striking bands of contrasting green, red, yellow and black the first world war pilot ship was a commissioned public art work for the city by Venezuelan artist Carlos Cruz-Diez. At 93 he is considered grandfather of op-art, the twentieth century art movement that sought to play with optical distortion, often utilising dense, complex patterns of lines to simulate 3-dimensional forms. Many will be familiar with the style; paintings that appear to twist, curve or bend. The 1960’s was full of the work, made most familiar by Bridget Riley here in the UK, but so popular was the fashion that it led to the adoption of the designs on everything from pottery to clothes. Whilst the dazzle effect was inspired by Cubism (notably it’s British exponents Wyndham Lewis and David Bomberg) its original intention was to confound German U-boats during the first world war, and it was very effective too. In order to shoot a torpedo at a moving target at sea the enemy needed to be sure of the angle, speed and distance. The usual camouflage (the mottled shapes of greens and browns that we’re accustomed to, that hide soldiers in undergrowth) doesn’t work, where the colour of the water and the sky change so often. Norman Wilkinson, a marine painter at the time, developed dazzle designs that created enough visual confusion to make determining the co-ordinates of a ship very difficult indeed. He was placed in charge of developing the navy’s ship painting and two dozen artists (camofleurs, as they were then named) were stationed in studios at London’s Royal College of Art. Drawings were carefully made, and laboriously tested with models, with experienced Navy personnel viewing them through small periscopes to assess their success. In all over 4000 ships and boats were painted up using these designs – an enormous logistical exercise as one can imagine. Wilkinson travelled across the Atlantic to work along the American Navy who similarly adopted the tactics. But most of these unsung heroes, working away in secret, were women – heroines no less. This year the RA celebrates it’s 250th anniversary, and it coincides with an overdue recognition of under-represented artists (female and ethnic minorities) in the war effort more broadly. But back to our story: the strategy of maritime visual disruption was successful enough to become widely adopted, and remained in active service until radar became commonly used. The influence of this quirky wartime invention is celebrated in a small show of work (Dazzle: Continuing the Art of Disruption) at Southampton City Art Gallery until 9 March and with Tate Liverpool’s Everybody Razzle Dazzle until 6 April. 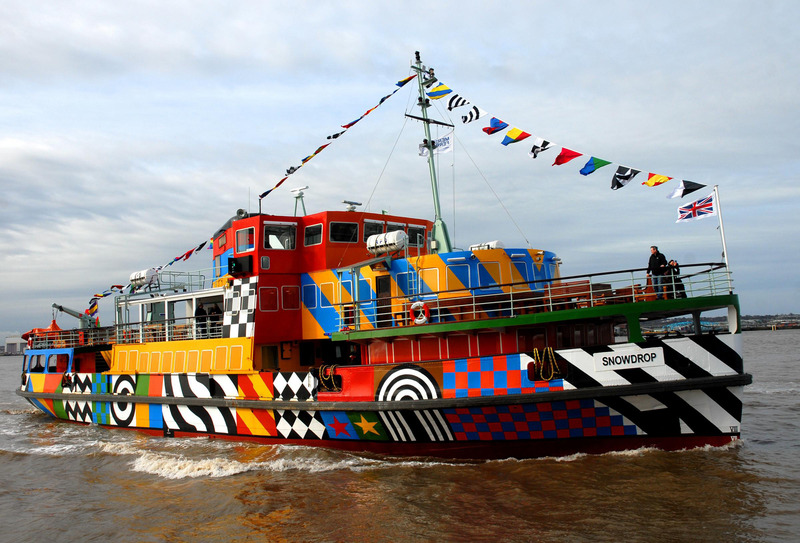 The Liverpool offering is actually an invitation to ride on the City’s active Mersey ferry ‘Snowdrop’ which has been painted up with designs by Britain’s Favourite pop artists Peter Blake (of The Beatles’ Sergeant Peppers Album cover fame – so there is a Liverpool connection). Exciting as it is to travel by boat for those living away from water, the visual impact will be best felt at some distance, those seeing it from shore. Onlookers can’t help but stare at the garish colours used, now that there is no longer the threat of enemy submarine fire. Liverpool’s ‘Snowdrop’ is just the third in a series of boats similarly re-painted to commemorate the first world war. London had H.M.S. President painted by the German sculptor and the fourth will feature the work of a female Turner Prize-nominated artist Ciara Phillips in Leith, Scotland. There’ll even be one touring New York harbour. Southampton’s exhibition looks at the influence of the ‘style’ with the work of other artists featured alongside a beautiful painting by Christopher Clark of the Aquitania at war from 1918. It is a large watercolour painting, measuring perhaps a meter in length and reminiscent of the pictures seen on the front of Airfix models as a child. The scene shows the vessel seemingly being tugged out to sea in preparation for battle. The colours are smoky and somewhat threatening, as are the patterns of lines in three-quarter view, with their jagged tooth-like stripes. The sea craft, a magnificent piece of naval engineering, is grand, majestic even. It’s blue, black and white fill the scene and match the skyscape above wonderfully. Only the small tug boats offer a patch of red and brown, and the sea itself a border of emerald below. The drama is palpable. The effect is, well, dazzling. Dazzle is the right word for these designs; temporarily blinding. The rest of the works in the Southampton show continue this idea, even if they are not dazzle designs strictly speaking. The centrepiece is surely the wall-sized mural by contemporary artist Lisa Traxler, entitled ‘Industry’ (2018). Measuring perhaps five by four metres and as such covering the end wall of the room, top to bottom, left to right, it has been applied to the wall directly by the artist. You are either struck by it as you enter the exhibition space, or it reveals itself as you turn, depending on through which door you enter. Pure black and white, like shattered, splintered glass, angular shards veer off in all directions. It’s as fun as it is dynamic. What adds to the pleasure is a similarly painted smock which visitors to the gallery are invited to wear and stand in front of the mural. My colleague and I took it in turns, ‘disrupting our silhouette’ as per the instructions. Although probably aimed at younger visitors we couldn’t help ourselves, and the gallery was empty at that point and for long enough for us to play. We photographed each other. It is the actually only way to see the effect. A mirror at the other end of the room would have helped, and perhaps also enlarged and expanded the idea of visual interruption and ambiguity. Galleries often and for good reason provide more than their usual captions to engage viewers in the material, but rarely are they quite as fully interactive as this, or as entertaining. I could imagine school children making their own, either back in their classrooms, or even better in the gallery itself with big sheets and crayons. We actually experimented with seeing how our ‘invisibility cloak’ might fare when seen in front of the Bridget Riley painting, ‘Red Movement’ (2005). Riley studied at the Royal College in the early fifties and this is another large painting, as many of hers now are, at maybe three metres wide by a metre high. Standing in front it fills your field of vision. The effect is less dazzling, as the colours don’t jar but rather swish and weave between and across themselves, with the overlapping ovals appearing like flames. I counted six or even eight different shades in the work; a range of violets, a sombre orange and autumnal greens and beige, even a pastel blue. The caption stated that “Op Art is not dazzle, however the aesthetic similarities allow the works to be exhibited together without clash or discord”. This is true enough, although again, it feels like a missed opportunity. Could they have gathered together even some photographs of women at work in the secret Whitehall shelters testing the designs, some of the original drawings perhaps, and seeing the colours schemes would have been fascinating, small models too. Other pieces in the show feel somewhat tenuous unfortunately. Street art by SNUB23 are ‘merely’ optical illusions of geometric forms on buildings and walls. At least facsimiles of BLAST magazine, the short-lived journal of the British Vorticists (our version of the European Cubists or Futurists), offers some context of the art scene around the time of the First World War. Lisa Traxler has two smaller paintings and a 3D construction in the show which have developed out of her research into the war, and more precisely wartime communications. Her titles, ‘Beauty Chorus’ and ‘ Chain Home’ refer to Churchill’s secret telephone control network and early warning coastal radar stations respectively. I read here that she has spent time on the Isle of Wight, working with now derelict bunkers, studying the abstract steel and concrete forms as they’re gradually enveloped into the rural landscape. It is “undulating and restless, ragged outcrops of gorse alongside craggy, weatherworn stone”. She works directly from first-hand sources to develop her own personal responses. Dazzle represents the coming together of art and technology; clever minds and skills hands working in unison with a very practical and urgent mission, a problem to solve. It is right and worthy that the centenary of the Great War is recognised in exhibitions such as this. 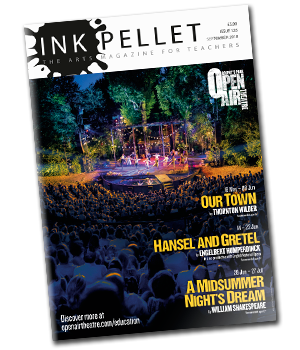 Useful too for new generations of aspiring art students to understand that their skills and expertise can play such a central and essential role in the real world. Young people growing up today should know that careers are possible and needed in our modern society, and not just for decorative ends. Dazzle: Continuing the Art of Disruption (www.southamptoncityartgallery.com/whats-on/dazzle-continuing-the-art-of-disruption/) at Southampton City Art Gallery until 9 March and Tate Liverpool’s Everybody Razzle Dazzle (www.tate.org.uk/whats-on/tate-liverpool/exhibition/everybody-razzle-dazzle) until 6 April.